We were sad to hear news that a Beşiktaş institution – well, an Istanbul institution – faces closure. Pando Kaymak, a favourite breakfast spot that makes its venerable kaymak (clotted cream) on the premises has been given an eviction notice, as reported by Culinary Backstreets on Friday. The café – featured in our ‘The Sultan’s New City’ guide in Cornucopia 51 and regular breakfast spot of the author Heath Lowry – has apparently been given until August 15 to close down. The café is operated by the 90-something-year-old Pandelli Shestakof and his wife, and 'Pando Amca', as he is affectionately known by the locals, has been sitting outside his blue-washed café, its windows adorned with jars of honey and fresh eggs, welcoming customers for over 50 years, having taken over from his father who had owned the shop since 1895. Culinary Backstreets claims the reason for the eviction is that Pando’s landlord wants to replace the café with yet another kiosk selling gum, cigarettes, newspapers and other bibs and bobs. In his column two days ago in Today’s Zaman, Berk Çektir, a lawyer and journalist, says the eviction is justified under 'a revised code of obligations that allows the landlord to ask the tenant to vacate the premises if the rental agreement has surpassed ten years'. So instead of valuing a long-term tenant (said to have been there for 120 years), the landlord decides to evict him. There’s loyalty for you. After receiving the news, Çektir immediately visited Pando and is now trying to find out whether he has any legal right to stay. Çektir thinks the best solution is for the landlord to 'co-operate with Pando to preserve cultural heritage' and is enlisting the help of a vakıf (foundation) which cares about food and cultural heritage. According to Culinary Backstreets, Pando's family’s main concern is saving the 19th-century shopfront from destruction, rather than Pando’s business itself. 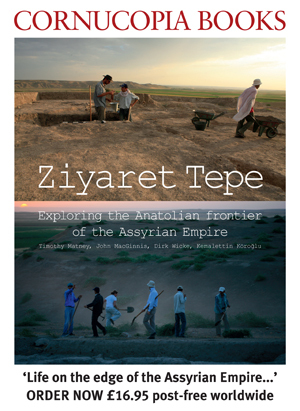 A Harvard student and expert in Ottoman agricultural practices, Aleksandar Sopov, who has spent last summer and this one fighting the good fight for the preservation of the Yedikule bostans, shared this gem on his Facebook page: ‘You will not read in the Culinary Backstreets article that Pando and his wife Yovana still speak the dialect spoken in the Macedonian village which their ancestors abandoned in the 19th century. Running away from economic hardships and exploitation, thousands of Macedonians settled in Istanbul at the end of the 19th century to work as gardeners, dairy-producers and bakers; cheap labour for a growing city that had to be fed. The descendants of those people are forced to leave again. Deep in that delicious clotted cream covered in honey there is so much bitterness.’ He added a #savepando tag which already has numerous retweets on Twitter. Well said, Aleks. If the eviction happens, it will be a very sad day. 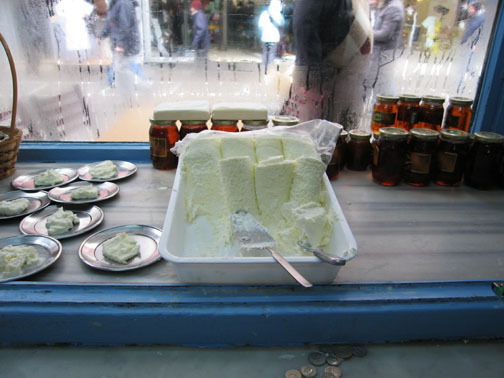 We can get a pack of gum or a newspaper at any old news-stand, but Pando’s kaymak is unparalleled. Isn’t it worth saving?